Bone - Decreased bone in a female B6C3F1/N mouse from a chronic study. There is focal thinning of cortical bone and loss of metaphyseal trabeculae (arrowheads). Bone - Decreased bone in a female B6C3F1/N mouse. Although the width of the bone is increased focally (arrowheads), the density is decreased due to thinning of cortical bone and redundant cortical spaces. 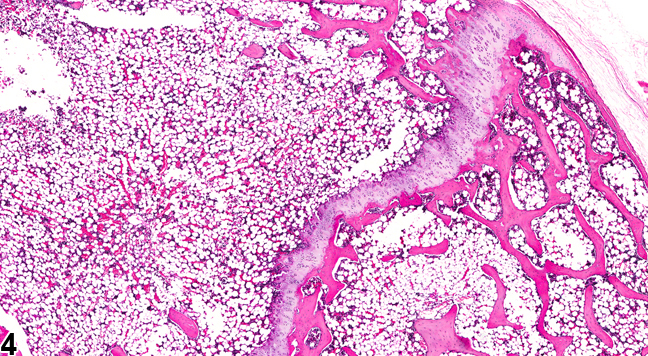 Bone - Decreased bone in a female F344/N rat from a subchronic study. There is loss of medullary trabeculae within the metaphyseal region in this section of long bone. 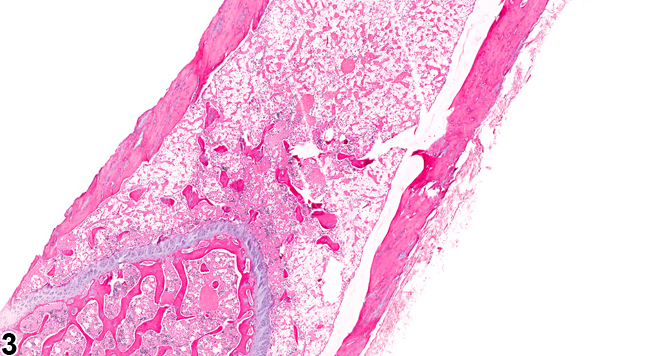 Bone - Decreased bone in a female F344/N rat from a subchronic study. There is loss of medullary trabeculae within the metaphyseal region. Decreased bone can result from either decreased bone formation or increased resorption of preexisting bone. The lesion is characterized by thin or absent bony trabeculae and/or thin cortices ( Figure 1 , Figure 2 , Figure 3 , and Figure 4 ). Microfractures may be observed. 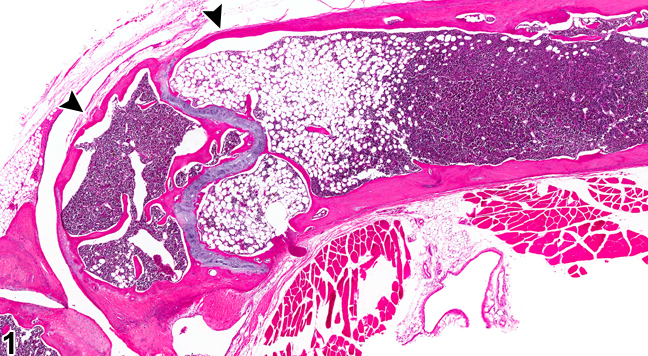 In lesions with active bone resorption, there are increased numbers of osteoclasts along a scalloped, irregular surface of trabecular bone, which represent osteoclastic effects on Howship's lacunae (resorption bays). A diffuse decrease in bone may result from metabolic disturbances, whereas a focal decrease in bone may result from a pathologic process occurring focally within a bone, such as fibro-osseous lesion or osteomyelitis. Disuse (atrophy), as in the case of injured limbs or joints, may lead to a diffuse decrease within a particular bone. Treatment with various compounds has been associated with diminished bone growth, including a decrease of metaphyseal trabeculae in corticosteroid toxicity due to effects on osteoclastic activity in rats and chondrogenesis and enchondral ossification in mice. Hyperthyroidism has been associated with thinning of cortical and medullary bone due to increased osteoclastogenesis and bone resorption. Dietary factors such as vitamin/mineral and protein intake can significantly influence bone growth; low levels of dietary protein lead to bone shortening, and toxicants that lead to decreases in body weight due to inanition can cause bone lesions characterized by loss of metaphyseal trabeculae and a narrowed and distorted physis. Loss of medullary trabeculae may also be observed in aged breeding animals due to increased calcium and protein requirements of pregnancy. This lesion has also been recorded as atrophy, osteoporosis, osteopenia, and resorption, but the more general term, "decreased bone," is preferred. The term "osteoporosis" is not recommended due to its more specific definition in human medicine as a clinical condition related to a generalized age-related or hormone-related loss of bone density. In humans, osteopenia is referred to as a precursor lesion/condition to osteoporosis, in which there is alteration of the proteins in bone and marked osteopenia, associated with increased risk of bone fracture. "Bone - Decreased bone" should be diagnosed and assigned a severity grade when it occurs as a primary lesion. The location of the lesion (both the particular bone and the location within the bone, e.g., metaphysis) should be described in the pathology narrative. A characterization of the process, if possible, should also be discussed in the narrative. Long PH, Leininger JR. 1999. Bones, joints, and synovia. In: Pathology of the Mouse (Maronpot R, Boorman G, Gaul BW, eds). Cache River Press, St Louis, 645-678. Long PH, Leininger JR, Ernst H. 1996. 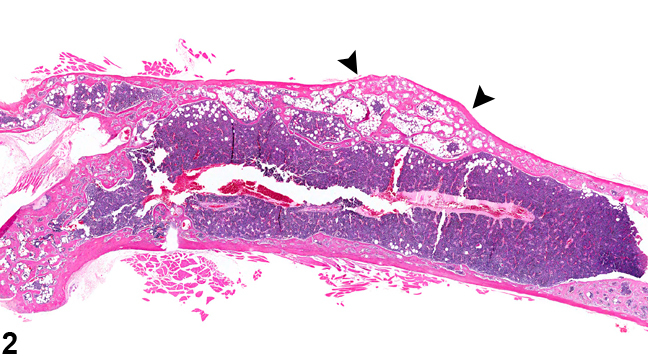 Proliferative lesions of bone, cartilage, tooth, and synovium in rats, MST-2. In: Guides for Toxicologic Pathology. STP/ARP/AFIP, Washington, DC. Revell PA. 1986. Osteoporosis and bone atrophy. In: Pathology of Bone. Springer, New York, 183-201. Silberman M, Weiss A, Raz E. 1981. Retardative effects of a corticosteroid hormone upon chondrocyte growth in the mandibular condyle of neonatal mice. J Craniofac Genet Dev Biol 1:109-122.